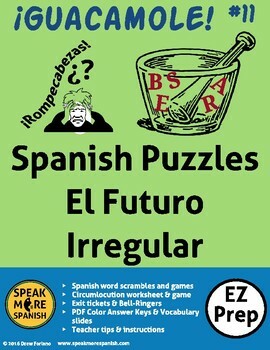 This is a fun Spanish word scramble and circumlocution activity to help learn the meanings of the irregular future tense verbs. 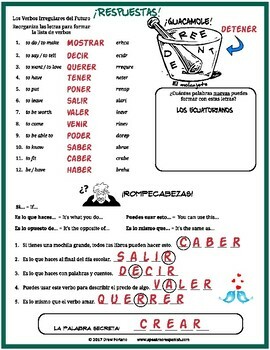 Students use their critical thinking skills to unscramble the words and complete the puzzle. 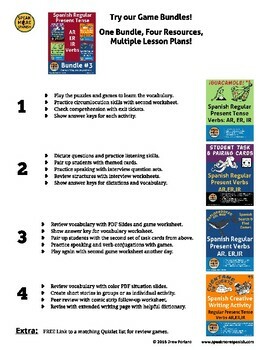 A follow up writing and speaking worksheets practice additional words that follow this pattern. * Two sets of exit tickets plus one blank set for your own vocabulary. * Two culture slides with photos of the Molcajete and Aztec Pictographs. 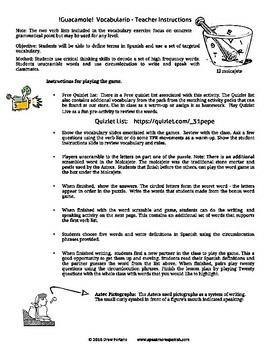 *Teacher Instructions and Tips for getting the most out of the activities. * A FREE link to a matching Quizlet list so you don't have to make up your own! Check out all of our BUNDLES! **Follow us for sales by clicking here and then clicking the green star under our store name at the top of the page. Thank you!